George was the youngest son of a slave woman who lived and worked on a farm in Missouri. When he was just a baby his mother was kidnapped by slave raiders. He was taken too but for some reason his mother’s captors decided not to keep him and he was later found by Moses Carver, his mother’s master. Moses and his wife raised George and his older brother, treating them with kindness and educating George. When they saw that George wanted to go to school they allowed him to leave their home and to go to a nearby town. To pay for his keep George got a job cleaning laundry. This was to be the pattern for some years. George would find another school to attend and he would work while he furthered his education. Finally in 1890 he was able to go to college. He was older than most of the other students but he didn’t mind. He concentrated on his studies and it was while he was in this college that his art teacher suggested that he should study botany and agriculture. She felt that George would be able to make a better living in that field than if he tried to make his way in the world as an artist. And so George transferred to Iowa State College and did so well that he went on to get a graduate degree. When it was time to leave the college George’s skills as an agriculturalist was well known and many schools wanted him to be a professor in their institution. George ended up picking the Tuskegee Normal and Industrial Institute. 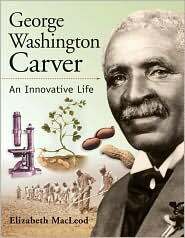 For the rest of his life George Washington Carver worked and taught at this school, and he was not only a much loved teacher but he was also an excellent researcher and scientist. Today George Washington Carver is often remembered for this work with peanuts but what many people forget is that the whole point of his work was to give farmers the tools to be more successful and profitable. More than anything he wanted to help farmers raise better crops so that they could provide for their families. He encouraged farmers to rotate their crops so that the soil would not be depleted and he suggested that they grow peanuts and soybeans as well as cotton. Then he showed the world that peanuts and sweet potatoes were excellent cash crops because both sweet potatoes and peanuts could be used to make all sorts of things. In this engaging title from the Snapshots series the author tells George Washington Carver’s story with verve and enthusiasm. A scrapbook like format with lots of annotated illustrations makes the book not only interesting to read but also enjoyable to look through.